In the early history of our town, up until 1826, there were no bridges across the Merrimack River between Lowell and Manchester. 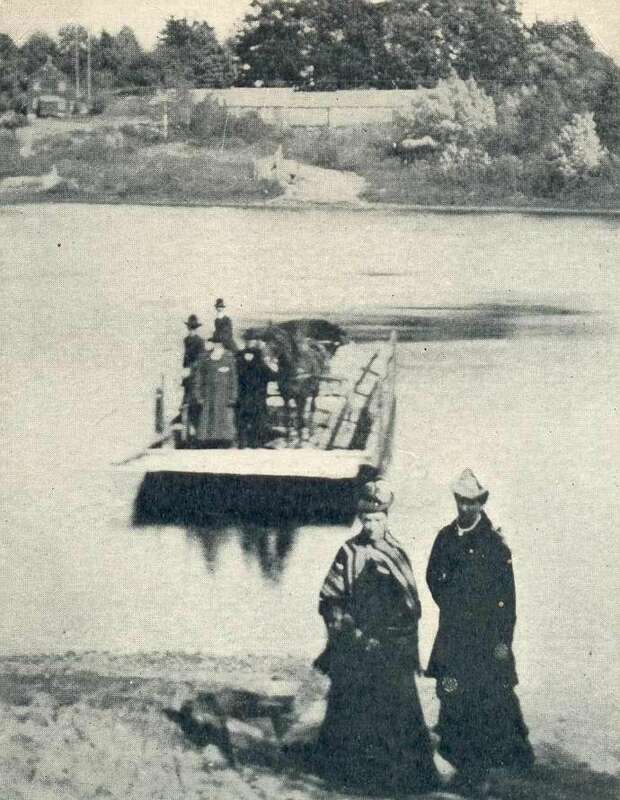 River crossings between Hudson (then called Nottingham West) and Nashua were made by ferry boats similar to the one shown in this week’s photo. During these early years there were no less than three ferries operating between the two communities. The earliest ferry was operated by Eleazor Cummings. His ferry left the east shore of the river a short distance north of the Veterans Memorial Bridge. It landed on the west side just south of the mouth of the Nashua River. Operation of this ferry continued until 1742, at which time Mr. Cummings relinquished his rights to another person who established Dutton’s Ferry just below the Taylor Falls Bridge. A second ferry, called Hardy Ferry, operated from Lowell Road near the Hardy Farm. A Third ferry, Hills Ferry, was operated on Hills land just south of the town line into Litchfield. This was started by Nathaniel Hills and was continued by later generations of his family. The first bridge between Nashua and Hudson was built in 1826. Even after it’s construction some of these ferries continued to operate. Photo from the Historical Society Collection. By Ruth M Parker in Bridge Area, Bridges on August 7, 2015 .
you learn something new every day I never had known about the ferry’s crossing the Merrimack River. Yes..Ferry Boats crossed between Hudson and Nashua in at least 3 different places. Just think how many years we crossed the River by car with only 1 bridge! !